Which Central Bank is Back in the Market? Although everyone’s focus is on the Federal Reserve’s interest rate decision this afternoon, we have a lot of action in the European currencies. If you notice, the Euro is one of the few major currencies to under perform the dollar this morning because of the massively well subscribed ECB refinancing. In my daily report on FX360, I have mentioned how the EUR/USD could pull back because European banks look at the refinancing as quasi Quantitative Easing. Although this is a big story, central bank intervention is the big focus this morning. 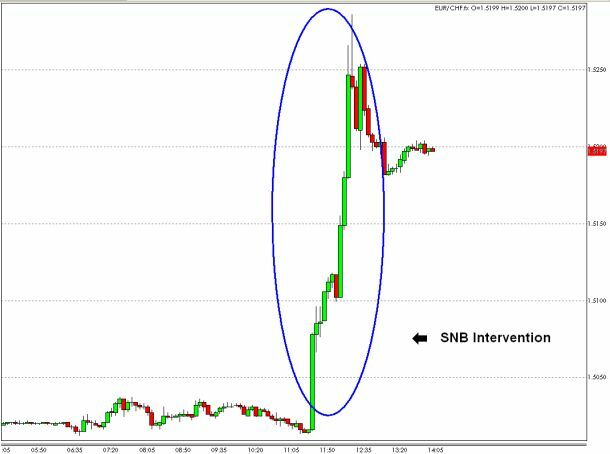 The Swiss National Bank is at it again! They have sold Swiss Francs aggressively, driving EUR/CHF and USD/CHF up more than 1 percent. Last week, I talked about how a move down to 1.50 creates a good risk / reward opportunity. EUR/CHF fell to 1.5007 last night, which probably triggered alarm bells at the SNB. Here is a chart of the move in EUR/CHF this morning. On FX360, I posted a more thorough analysis as well as charts from previous SNB interventions.